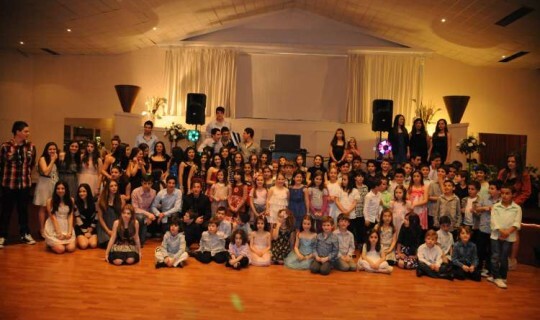 The Greek Orthodox Community of Melbourne & Victoria's afternoon and Saturday Greek language Schools hosted its annual Dinner Dance at Stars International Receptions on the Saturday 17th September. Over 300 students, families, staff and friends attended the dance and spent an enjoyable evening filled with music and dancing. The highlight of the evening were the impressive traditional Greek dancing performances by the students of all ages, led by their teacher Jenny Iliou. Mr. Bill Papastergiadis, President of the GOCMV attended with his family as did the Co-chair of the Antipodes Festival Mr. Leonidas Vlahakis. All present were thrilled with the warmth of the atmosphere created by the students. The Education Coordinator for the GOCMV, Mr. Theo Markos thanked the parents for their support and noted the impressive presence of the staff at the dance. He also reminded the audience of the new GOCMV website (www.greekcommunity.com.au) as well as the upcoming 18th Greek Film Festival at Palace Cinema Como, which commences on the 12th October. The Principal Mr. John Milides announced that the GOCMV is preparing for its students an educational trip to Greece in 2012. The announcement, which received the applause of all present, was also praised as a significant step for students in experiencing and learning both the Greek language and culture. He went on to thank the Parents of the Organising Committee, in particular: Evie Apostolos, Panagiota Mahlis, Mary Houndalakis, Anastasia Stojnic, Maria Kiverniktakis and Sofia Karmis.